The foundation of the Star Wars universe is built upon the heroic monomyth and unsurprisingly, filled with heroes and villains. In the original trilogy, we immediately think, Han, Luke, and Leia. In the prequel trilogy, which embodies the creation of a villain, we still have Padme, Qui-Gon, and Obi-Wan. Even in The Force Awakens, it’s Rey, Poe, and Finn. In the background, however, stands perhaps the most pure hearted hero of the franchise, Chewbacca. We see Chewbacca well before we hear him, seated beside Han Solo in the Mos Eisley cantina, and incidentally, are forced to rely upon others to translate every single word spoken by the brown and black wookiee. Despite this language barrier, there has never been a case where we didn’t know where Chewbacca stood or how he felt, as the Leia described ‘walking carpet’ has always worn his heart on his sleeve, well, metaphorical sleeve. Consider the personality traits one would use to describe any of the heroes of Star Wars, and most likely, with Chewbacca, the first to pop in your head is loyal. 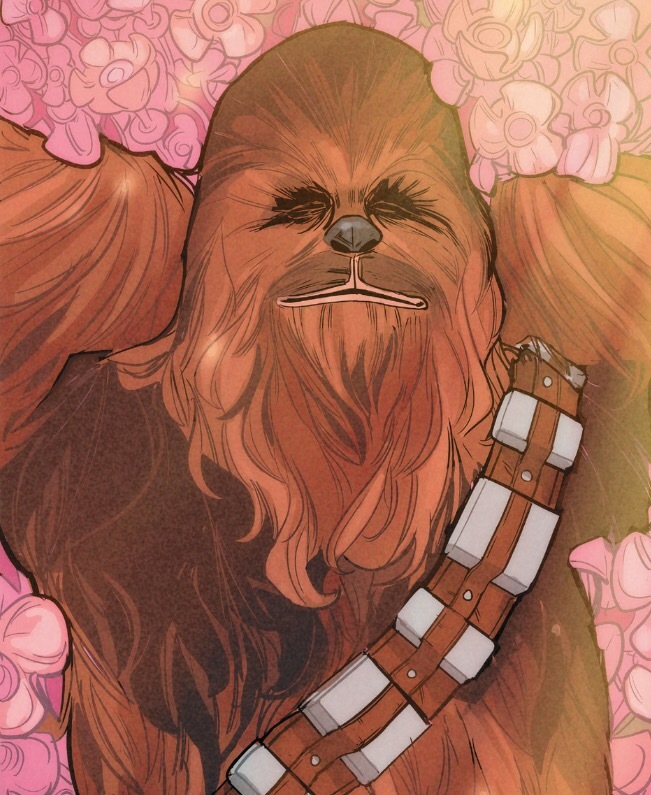 Next might be strong, but we can also surprisingly include emotional, and it’s Chewbacca’s willingness to expose his vulnerable self to the world which has made him so endearing. A New Hope presented a wookiee who complained about a legal holochess move and worriedly pounded the exit door to a trash compactor. It also presented a wookiee capable enough of keeping up with Han Solo, copiloting the Millennium Falcon, and honored before the Rebel Alliance for his role in helping Luke Skywalker destroy the first Death Star. The wookiee who emerged in The Empire Strikes Back added to this complexity, assuming a level of technical prowess from the mechanical repairs needed on a certain YT-1300 light freighter to rebuilding a disassembled protocol droid (and a rather unthankful one at that). His deep emotional attachment to his friend, Solo, emerged throughout the film, such as his somber whimper when the Hoth base hangar doors are closed, the angry roar when he tosses one storm trooper to the ground before Han is frozen in carbonite, or when he unflinchingly lifted Lando Calrissian from the floor by his neck after Lando’s betrayal. It’s with the same Calrissian whom he then sets off with in the Falcon to figure out a way to save Solo at the film’s conclusion. Through it all, Chewbacca remained steadfastly by Solo’s side, in the snows of Hoth or the hallways of Cloud City. This remains true in Jabba’s palace in Return of the Jedi, where entirely for the sake of rescuing Han, the wookiee who shied away from handcuffs in A New Hope, allows himself to not just be handcuffed for the ruse of infiltrating the gangster’s lair, but to be imprisoned in the Hutt’s dungeon. Notably, never in any of the films has any other character been given the adjective “mighty” by another except once. Hutt refers to Chewbacca in this sense, “The mighty Chewbacca,” perhaps indicating a level of respect given to none others, especially when he forces C-3PO to add that adjective to the list of titles when addressing Luke Skywalker later. The familial bond between Chewbacca and Solo is perhaps best illustrated when a newly unfrozen Solo is dumped into the same dungeon cell as the wookiee, and Chewie’s response is to wrap Han in a crushing hug. Jedi also played upon the same dualities of innocent child and tech genius as appeared in A New Hope. It’s Chewbacca’s stomach and inability to see a trap which lands the rebels on the dinner menu for the Ewoks, but it’s also Chewbacca’s prowess with machines which allow him to capture and operate an Imperial AT-ST entirely by himself. Without Chewbacca’s heroics, it’s questionable if Han’s ruse against the Imperial outpost would have worked, brought down the shield around the second Death Star, and ended with the death of the Emperor. That’s right, the death of the Emperor, it all goes back to one wookiee and his forceful appropriation of Imperial property. And while falling for that trap on Endor offers strong evidence that the wookiee sometimes doesn’t always think things through, a lot of his behavior takes on a more somber note when we look at the backstory that quietly flourished in the Legends universe and now again in the present expanded universe. Never mentioned in the films is the fact that Chewbacca was once a slave. His entire planet, in fact, was enslaved by the Empire and at one point or another, Han Solo freed a wookiee and gained a friend for life. In the expanded universe, we have a flashback to this darker period in Chewbacca’s life in the self-titled Marvel comic, Chewbacca, of the wookiee imprisoned in a narrow metal cell surrounded by the reptilian Trandoshans (remember Bossk, the lizard bounty hunter in Empire? That’s a Trandoshan.). Likewise, the terrible state of Kashyyyk, the wookiee homeworld, is explored in Chuck Wendig’s Aftermath: Life Debt. The implications of Chewbacca’s past paints a picture of trauma related to being captured, restrained, and imprisoned, one which he struggles with and overcomes in almost every scene in the films in which his overreaction to something mundane is featured. Consider the handcuffs in A New Hope and the level of courage Chewbacca must draw upon to replicate his enslavement in Jabba’s palace. Of the other heroes of the Star Wars universe, perhaps only Rey overcomes such emotional trauma for the greater good in the same style as Chewbacca. It’s also in The Force Awakens in combination of Claudia Gray’s Bloodline that we can truly appreciate how big a wookiee’s heart can be. The Force Awakens introduces Chewbacca at the side of Han Solo, casting nothing different in their lives than that which we saw in their last film appearance. Without Bloodline we would be left to think nothing more about Chewie’s presence, but it takes on a much more tragic role when one single sentence places it into context. As anyone who has seen the film knows, the great romance of Han and Leia could not survive the loss of their son, resulting in the galactic equivalent of a divorce. What was unsaid was that for many years leading up to it, Chewbacca had actually left the copilot seat of the Millennium Falcon, and pursued a life of “domestic bliss” back with his family on Kashyyyk. This, taken in with Chewie’s appearance in the film, leads to only one conclusion: Chewbacca left a life of a happy life with his family back home to return to the side of his emotionally wounded friend. Very few heroes in Star Wars have made such a willing sacrifice.